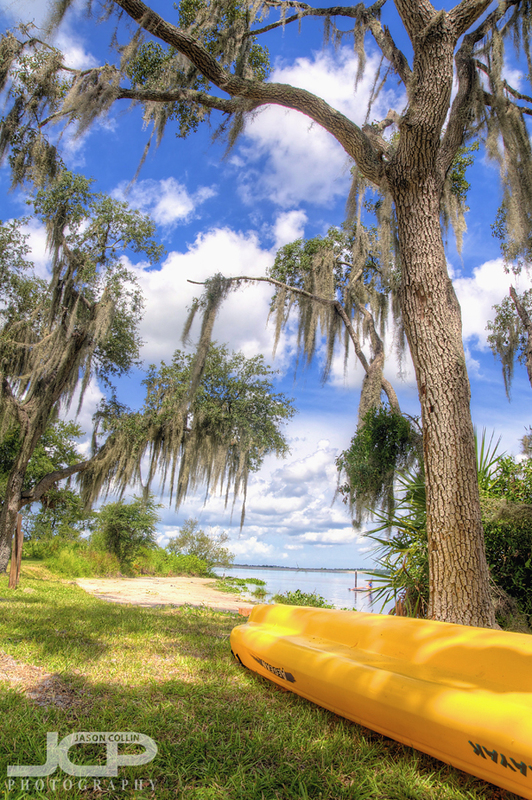 Kayaking opportunity on Lake Manatee - Nikon D300 Tamron 17-50mm @ f/11 ISO 200 5-bracket HDR tripod mounted with Nikon MC-30 cable releaseI was excited to spot Lake Manatee State Park on Google Maps. It seemed like it was an exciting find as I especially like to visit state parks with lakes or rivers. In fact, it is a very modest state park with one small, but nice access point to the lake, which is itself somewhat nondescript. In other words, the place was basically a desert. The campground was booked solid with it being Labor Day, but the park still felt rather empty. This is normally ok with me, but it seems there was a reason for it being so. Kiki was with us so we could not swim in the lake (against its alligator attracting rules), a prudent precaution by the park, but with a number of people swimming, including children, it would seem quite safe enough and any alligator would be avoiding the human contact of the area. Still, we could have rented a canoe and brought Kiki on the lake that way, and since you can only rent a canoe at the entrance, we thought we should have just rented one then and saved the return trip. However, we ended up being glad we did not fork out the $10 for a 2-hour rental ahead of time as the lake offered no cover and we would have only boiled on its surface with minimal sightseeing opportunities. Nikon D300 Tamron 17-50mm @ f/11 ISO 200 5-bracket HDR tripod mounted with Nikon MC-30 cable releaseDespite all that we enjoyed window shopping as we walked through the campground wondering what all the trailers and RVs looked like inside and had a nice picnic lunch on one of the numerous covered table areas. We even made use of the playground for a bit. Visit this park in cooler weather and I do not recommend bringing a pet/dog since the park's best feature, the lake, is basically off limits to them.